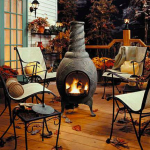 An increasingly common centerpiece in backyard patio design is the beautiful chiminea. The variety of materials and shapes they can be found in lend themselves well to outdoor landscaping and patio design for just about any aesthetic you might wish for. They provide a beautiful focal point and source of heat for chilly nights without sacrificing the ever usefulness of a center table for your chairs. But have you ever stopped to wonder what else you could do with a chiminea as you sit with friends late into the evening, watching the fire burn down? 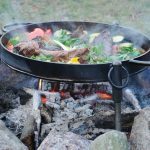 An obvious thought would be hotdogs and s’mores, as the go-to meals for any open fire, but the options really don’t stop there. Opportunities for making food in your chiminea are endless. The name chiminea comes from the Spanish word for chimney – chimenea. 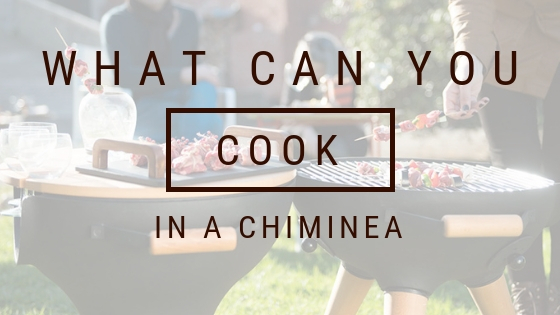 In fact, while chiminea is the more modern spelling, much of the Spanish-speaking world spells it with an e – chimenea. The two spellings are entirely interchangeable. Chimineas have been around for hundreds of years and the traditional Spanish influenced Mexican design dates back approximately 400 years. They were traditionally the centerpieces of homes and were used for heating, cooking, and entertaining. The draught of fresh air brought in continuously through the front is drawn up through the chimney and causes the fire to burn hot and relatively cleanly, leaving less ash than your barbeque typically will. Traditionally chimineas are made from clay but today cast iron and cast aluminum are preferable due to their superior durability. 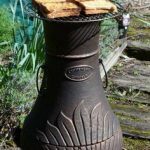 Cast chimineas are better able to withstand the elements and can be used with charcoal, which should not be used in a clay chiminea. For a clay chiminea, be sure to fill the bottom of the basin with at least 3” of sand or lava stone to prevent it from cracking due to direct heat and dramatic temperature changes. 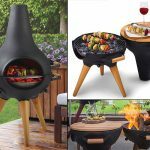 The open flame of the chiminea combined with the walls and chimney result in something of a cross between a barbeque and an oven that lends itself very well to a variety of cooking methods for almost anything you could wish to cook. Chimineas are great for barbequing and grilling with and are perfect for entertaining a small gathering of your favourite people. Chimineas are smaller than a typical barbeque so be sure to plan accordingly. 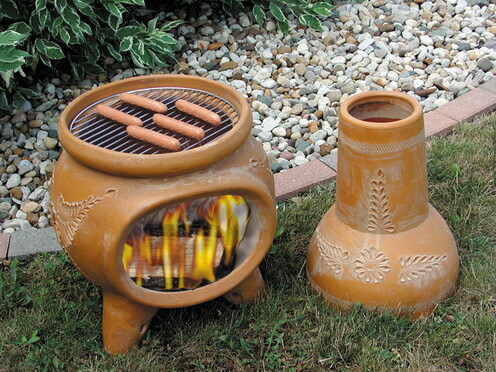 For entertaining larger crowds barbeque attachments for chimineas are readily available. 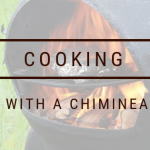 Many chimineas come with a slide or swing-out grill but if yours doesn’t there are many on the market or you can make your own by using any stainless steel or fire-resistant and food safe metal grill. Cooling or cake racks are great for this. Use firebricks to provide an even and stable base for your rack above the burning fuel. Charcoal burns hot and provides a steady heat for cooking without imparting extra flavor to your food, making it an ideal fuel for barbequing. If you have a clay chiminea dry woods work great as well. The enclosed grill in a chiminea and more concentrated heat mean your food will cook quickly so watch it carefully. This feature and oven-like quality means chimineas lend themselves well to baking breads, pizzas, or anything else you’d put in the oven! You can bake foods like potatoes in the coals by wrapping them in foil, place food directly on a ceramic tile or metal sheet to cook, or just bake in a dish set on the grill. You can even set skewers on an angle to cook over the coals. 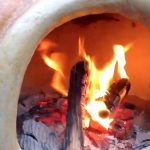 One of the most popular foods to make in a chiminea is pizza. 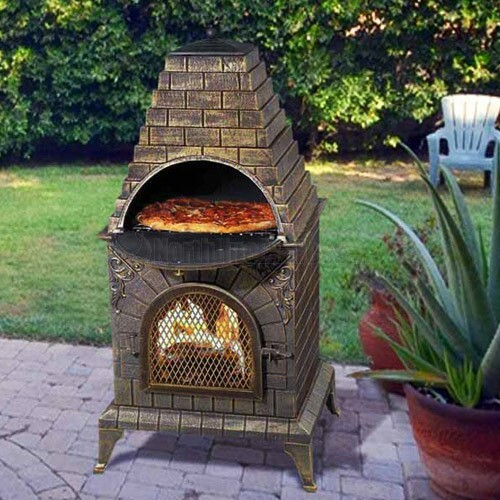 In only a few minutes in the high heat on a pizza stone, the chiminea produces delicious wood fired pizzas. For an even quicker bake in a cast chiminea, you can use charcoal. Make sure not to use too many toppings or you may end up with a soggy bottom. Precooking your toppings while your pizza stone preheats is also recommended. Once your pizza is in, watch for bubbling melted cheese on top and a nice browning around the edges to tell you it’s ready! Chimineas also make a great bread oven that lends itself especially well to flatbreads such as focaccia or naan. Bread bakes beautifully on a pizza stone or ceramic tile as well as in cast iron pans for beautifully browned sides. 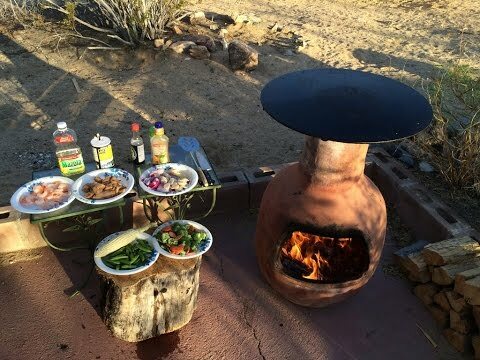 To bake an entire meal for example, consider baking chicken tikka masala and naan in your chiminea. Just imagine how good that would smell. Another fun thing to do with your chiminea is to use it as a smoker. The natural draught of a well-designed chiminea draws the smoke up through the chimney past your food. For ease and a greater capacity, smoker attachments are available for on top of your chiminea chimney. Fish is a very popular food for smoking in a chiminea but you can smoke just about anything. Smoked bacon is another favourite. Just skewer the food or use a smoker fish basket and hang it in the chimney from a skewers set across the top or from a grill set atop the chimney. It doesn’t take very long to produce delicious flavour. Just check the food regularly and remove when it’s cooked to your satisfaction. Dampened wood chips or chunks will provide all the smoky flavour you could desire. Barbeque smoke bombs are also available through may retail outlets. 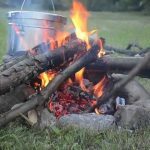 Use a hard wood such as beech, hickey, oak, and fruit woods for smoking and mix it up depending on what you’re cooking. Avoid soft woods that release resin and add a harsh acrid flavour to your food. Don’t forget to get your guests involved! Since chimineas make such a lovely focal point of any backyard design, why be out cooking alone? 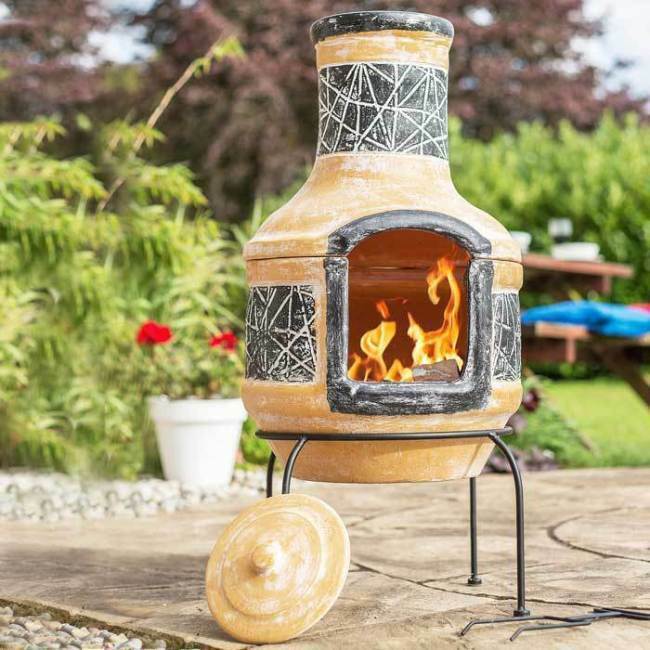 Bring your guests outside to enjoy the beautiful summer weather with you and to whet their appetite with the enticing smells coming from your chiminea. If you’re making something like pizza why not bring out all the toppings and have them build pizzas with you right before you cook them. Then enjoy the results while you make the next one. Use your imagination with cooking in your chiminea. The sky is the limit. When you’re done cooking, sit back and relax with your guests with a cheerful fire relit in your chiminea to provide some warmth against the chill of evening and a lovely ambience.